Bihar Vidhan Sabha Junior Clerk Final Result 2019 Check Here. Bihar Vidhan Sabha Advt. No. 01/2018 Assistant & Other Post Result- Result | Score. Bihar Vidhan Sabha Junior Clerk Marks Check Here. Bihar Vidhan Sabha Junior Clerk Result Check Here. Bihar Vidhan Sabha Answer Key 2018 Check Here. Bihar Vidhan Sabha Assistant & Other Post Mains Exam Admit Card (Advt No. 01/2018) Check Here. Bihar Vidhan Sabha Other Posts Admit Card 2018 Check Here. 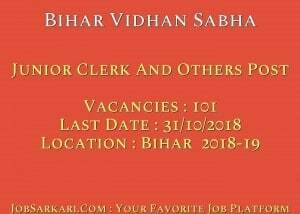 Bihar Vidhan Sabha Junior Clerk Admit Card 2018 Check Here. Bihar Vidhan Sabha Mock Test 2018 Check Here. Bihar Vidhan Sabha Notification is out. Bihar Vidhan Sabha is recruiting for 101 Assistant And Others Post Govt Job Mains Posts. 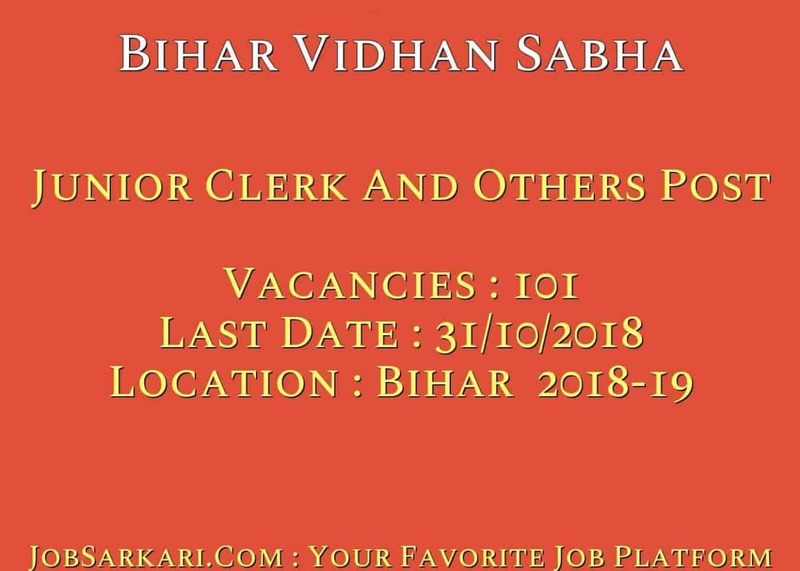 You can check Bihar Vidhan Sabha - Bihar Vidhan Sabha last date, download Bihar Vidhan Sabha notification, visit Bihar Vidhan Sabha official website and check other Bihar Vidhan Sabha Vacancy details.Complete Vacancy and recruitment Details about 101 Assistant And Others Post Govt Job Mains vacancies in Bihar Vidhan Sabha are provided below by JobSarkari.Com only for you. Last Date of Apply Online For Mains. 22/03/2019. Last Date of Pay Application Fee. 31/10/2018. Junior Clerk Exam Date. 12/12/2018 to 15/12/2018. Others Post Exam Date. 18/12/2018 to 24/12/2018. Mode of Payment. Candidate Need to Pay Through Net Banking, Debit Card And Credit Card. Junior Clerk. Candidate Must Have Passed Class 12th. 09. 03. 02. 03. 00. 17. Assistant. Candidate Must Have Passed Graduation 29. 13. 02. 09. 01. 54. Assistant (Research/Referrals). Candidate Must Have Passed Graduate in Science With Post Graduate in Any Subject. 04. 02. 01. 01. 00. 08. Assistant Librarian. Candidate Must Have Passed Graduate in Science With Post Graduate in Any Subject. 05. 02. 01. 02. 00. 10. Assistant (Urdu). Candidate Must Have passed Graduation or Equivalent With Urdu As One Subject. 00. 01. 00. 01. 00. 02. Translator(Urdu). Candidate Must Have passed Graduation or Equivalent With Urdu As One Subject. 01. 00. 00. 01. 00. 02. Translator (Hindi/English). Candidate Must Have passed Graduation or Equivalent With English As One Subject. 01. 01. 00. 00. 00. 02. Assistant Teacher. Candidate Must Have passed Graduation or Equivalent. 03. 01. 01. 01. 00. 06. Total Vacancy. 52. 23. 07. 18. 01. 101. For Junior Clerk Post. 18 Years. 37 Years. For Other Post. 21 Years. 37 Years. Age Relaxation. 3 Years For OBC And 5 Years For SC/ST. 3. Candidate Have to Fill All the Details in Application Form and Need to Upload All The Documents As Mentioned in Notification. 4. Candidate Need to Apply Online Before 31st October 2018. Q. What is the Last Date For Bihar Vidhan Sabha Assistant And Others Post Govt Job Mains Vacancy ? A. Last Date for Bihar Vidhan Sabha Assistant And Others Post Govt Job Mains Posts is 31/10/2018. Q. What is the Form Type of Bihar Vidhan Sabha Assistant And Others Post Govt Job Mains Recruitment ? A. The Form Type for Bihar Vidhan Sabha Assistant And Others Post Govt Job Mains Posts is Online. Q. How many vacancies are available in Bihar Vidhan Sabha Assistant And Others Post Govt Job Mains Posts ? A. There are about 100 Vacancies in Bihar Vidhan Sabha Assistant And Others Post Govt Job Mains Posts. Q. What is the Full Form of Bihar Vidhan Sabha ? A. Full Form of Bihar Vidhan Sabha is Bihar Vidhan Sabha .